Oscar outlook: It's taken seven long months, but Hollywood finally has a film that's generating a best picture Oscar buzz. That likely contender is Warner Bros., Canal+ and RatPac-Dune Entertainment's PG-13 rated World War II action drama "Dunkirk," which has boxoffice success and critical acclaim going for it. Those are the twin factors it typically takes to get on Academy members' radar screens for consideration. It also helps that "Dunkirk" has a high profile pedigree with writer-director Christopher Nolan, whose credits include "The Dark Knight" trilogy, "Interstellar," "Inception" and "Memento." In its second weekend in theatres, "Dunkirk," which stars Fionn Whitehead, Damien Bonnard and Aneurin Barnard, held on to first place with $28.1 million, falling only 44 percent. Its domestic cume of $102.8 million will continue to grow in the coming weeks as adult moviegoers catch up with it. Internationally, it's done $131.3 million, bringing its global cume to $234.1 million. Unlike younger audiences, who show up quickly to see films of interest to them, adults take longer to make time for moviegoing. That typically translates into good boxoffice "legs." IMAX continued to be an important factor driving "Dunkirk's" boxoffice success. IMAX said Sunday morning that the film "had another phenomenal weekend in IMAX adding $12.3 million in global boxoffice from 710 IMAX screens in 68 markets. Shot almost entirely with IMAX 70mm 2D film cameras, moviegoers worldwide continue to make IMAX their format of choice. 'The worldwide IMAX cume is now $40.1 million. In North America (it) earned another $6.2 million from 403 IMAX screens. 17 of the Top 20 domestic runs were IMAX locations. The domestic IMAX cume is $23.1 million, representing nearly one-fourth of the film's total stateside box office." Internationally, according to IMAX, it "delivered another $6.1 million from 307 IMAX screens. Openings in Italy, China, and Japan (are) still to come. The international IMAX cume is $17 million." "Dunkirk," which reportedly cost about $150 million, now has a 93 percent Certified Fresh score on Rotten Tomatoes, up 1 percent from where it was opening weekend. That level of critical acclaim not only drives ticket sales, but also attracts Academy interest. Not surprisingly, Oscar voters turned out in big numbers for the picture's opening weekend Saturday night screening in the Academy's Samuel Goldwyn Theatre at its Beverly Hills headquarters. To accommodate the surprise overflow crowd, a second screening was quickly added for later that evening. While "Dunkirk" is the first film this year to spark a serious Oscar buzz, it's important to remember that the awards season doesn't really get underway until the early fall film festivals arrive. The Big Three are: the 74th annual Venice Film Festival (Aug. 30 – Sept. 9), the 44th annual Telluride Film Festival (Sept. 1 - 4) and the 42nd annual Toronto International Film Festival (Sept. 7 - 17). In upcoming columns, I'll look at some key festival contenders likely to attract Academy attention. Exposure at these and later fall festivals is a major part of the awards marketing strategy for today's Oscar hopefuls. They benefit from the global media spotlight that loves these star-studded events with their red carpet premieres. Films that do well with festival audiences, critics and juries usually become part of the early Oscar conversation, which keeps them in front of Academy members throughout the fall. When critics groups around the country begin voting in early December, they typically wind up honoring the movies that emerged from the festivals. Then the early awards giving groups start nominating contenders or announcing winners, also typically gravitating to the same portfolio of films that have survived months of campaigning. But surviving isn't easy, especially with many new contenders surfacing later in the year as the new kids on the awards block – just in time to be applauded by the Hollywood guilds and nominated by high profile groups like the Hollywood Foreign Press Association (Golden Globes), the Broadcast Film Critics Association (Critics Choice Awards) and the British Academy (BAFTA's). In "Dunkirk's" case, its early Oscar buzz is certainly great to have, but it will have to hang on now for a long time while other titles take over the media spotlight. Despite having directed a string of high profile hit movies over the years, Nolan hasn't really resonated on the Academy's best picture front. His only best picture Oscar nod came in 2011 for his 2010 sci-fi action adventure "Inception." But Nolan's years in Oscar's best picture deep freeze could thaw now that Hollywood's getting overheated about "Dunkirk's" awards prospects. Nolan was widely considered to have been a key factor in the Academy's decision to expand its best picture category starting in 2010 to include 10 nominees rather than five. This came about after Nolan's critically acclaimed 2009 blockbuster "The Dark Knight" was snubbed in the best picture noms. The Academy was perceived as having ignored a critically acclaimed big studio hit in favor of nominating the smaller indie dramas that were then -- and still are today -- dominating the Oscar race. Allowing for 10 nominees was thought at the time to be a good way to let Academy members honor one or two worthy studio hits while still having many slots available for indie films that had done well with critics and festival audiences. Instead, Oscar voters mostly used those additional slots for more indie titles. After two years, the Academy revised its best picture category again, this time allowing for up to 10 noms through a "preferential voting system" -- that almost no one really understands – in which voters rank five titles in their order of preference. It's a system that's worked mostly to the advantage of indie dramas. (2) TITLE: "The Dark Knight Rises"
(4) TITLE: "The Dark Knight"
Bottom line: Although "Dunkirk" was attacked on two fronts in last weekend's boxoffice battle, it still held on to the top spot with $28.1 million and a domestic cume of $102.8 million. Columbia and Sony Pictures Animation's PG rated 3D animated family comedy adventure "The Emoji Movie" opened second to a solid $25.7 million at 4,075 theatres. Hollywood handicappers had been projecting an opening of $25 million to $30 million. "Emoji," which reportedly cost only about $50 million to make, scored a really rotten 8 percent on RT. The critics' thumbs-down probably dampened its ticket sales, but it didn't kill them as happened to other films earlier this summer. It also didn't help that "Emoji's" an original animated feature without any high profile roots as a kids' book or TV show. And it's not part of an established brand name family franchise. 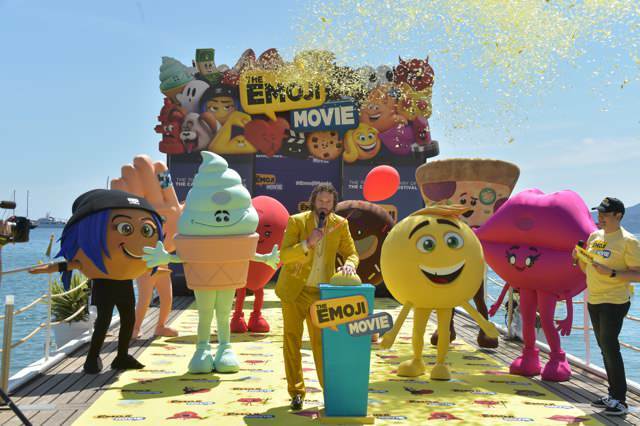 "Emoji" did, however, benefit from being the only new animated family film in the marketplace. It was, therefore, the default choice for parents who needed something they could take their kids to see this weekend. Directed by Tony Leondis ("Igor"), it stars the voices of T.J. Miller, James Corden and Anna Faris. Third place went to Universal and Will Packer Productions' R rated comedy "Girls Trip" with $20.1 million in its second week and a domestic cume of $65.5 million. Directed by Malcolm D. Lee ("The Best Man Holiday"), it stars Regina Hall, Queen Latifah and Jada Pinkett Smith. Last weekend's other wide opening, Focus Features and Sierra/Affinity's R rated action spy thriller "Atomic Blonde," finished fourth with an okay $18.6 million at 3,304 theatres. It scored 75 percent fresh on RT. "Blonde" reportedly was made for just $30 million, which was funded by Sierra/Affinity. Hollywood handicappers had estimated an opening of about $20 million. It's from first time feature director David Leitch, whose extensive Second Unit Director credits include such blockbusters as "Jurassic World" and "Captain America: Civil War." Starring are: Charlize Theron, James McAvoy and John Goodman. Last weekend's domestic ticket sales were about $148 million, according to comScore. That was down 22 percent vs. $190.4 million a year earlier when "Jason Bourne" opened in first place to $59.2 million. The domestic boxoffice to date this year is $6.821 billion, per comScore, down 1.3 percent vs. $6.908 billion this time last year. Last week, 2017 was down 0.7 percent.